With a two week break between the third and fourth league games, the outcome of those first 3 games could well define the narrative for the rest of the season. In my head I was hoping for 6 or 7 points from those games but willing to consider 4 points an OK start, to get 9 is superb. In the review of the Burnley game I mentioned that had we got a second goal that we arguably deserved from the 1st half play in that game, it could well have turned out to be a comfortable 3-0 rather than a case of riding our luck a bit. 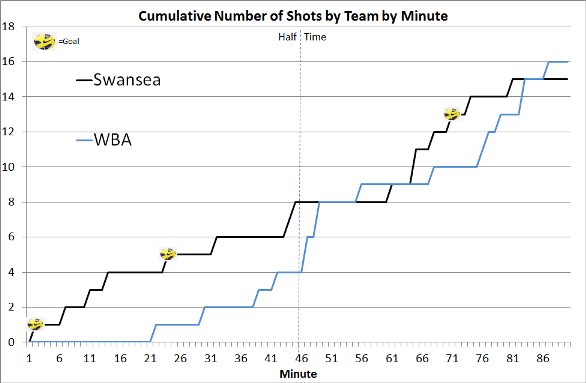 Against West Brom, that second goal came along (and how! I still can't quite get my head around how Routledge gets the power on the shot but still ends up landing on his feet) with the third following mid way through the 2nd half. As great as Routledge's goal was, and as encouraging as it is to see Dyer with 3 goals already, the main story has to be the impact Gylfi Sigurdsson has had on the season so far. Of the 6 league goals scored so far, he's scored 1, assisted 4 and also crossed the ball in that was only half cleared for Routledge to work his magic. I remember those brief few days in Summer 2012 when Brendan was still manager and Gylfi had agreed to sign, such was his impact my first thought was 'We're safe next season then'. I'm certainly glad it didn't happen but there's a parallel universe somewhere in which Pulis managed to sign Gylfi and is still in charge of Crystal Palace. It's always difficult to know what's true and what's rumour but I can imagine Pulis felt pretty much the same in that having someone like Gylfi in your team pretty much guarantees goals and that failing to land targets like him was making his job harder than he wanted it to be. 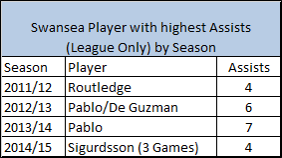 To put those 4 assists so far this season into context, it's as many as any player managed for Swansea in the league during our first season in the Premier League 2011/12 (Gylfi himself had 3 from half a season), and already closing in on the 6 in 2012/13 and 7 last season from Pablo. There's no reason to be afraid of anyone this season and with arguably the strongest squad we've had over the 4 seasons in the Premier League the target has to be top half or even the 'best of the rest' title for 8th place, that said safety is always the first target and considering West Brom were able to stay up with only 7 wins (and 15 draws) that's a long way towards being achieved already.